The charming and erudite host of Jeopardy!, Alex Trebek, is surprisingly sardonic off camera. The studio audience—about 100 split between members of the general public on the left side of the theater, friends and family of the contestants on the right—had plenty of opportunity to ask him questions during down times between segments, sampling his slightly cynical sense of humor. I got in the first question, a technique I used as a reporter, knowing that even at a major press conference there is often a reluctance to ask the first question. So I prepared my question in advance, rehearsed it mentally and was ready to go when Trebek asked for questions from the audience. I asked if he'd ever been a game show contestant; if he would ever be a contestant on Jeopardy! before he retires; and how did he think he'd do as a Jeopardy! contestant. He said he'd been a contestant on a few game shows, but would not be a contestant on Jeopardy! because then someone else would have to host the show, and "he might be better than I am." How would he do as a Jeopardy! contestant? Trebek said he would probably do well against his "peers." Then, looking directly at me, he said, "I see by your white hair that you might be one of my peers. I would crush you!" A middle-aged man in the mostly middle-aged audience asked, "How do you pronounce all those foreign words?" Trebek answered with overemphasized, drawn out speech: "W-i-t-h M-y M-o-u-t-h."
I also talked to crisp-toned announcer Johnny Gilbert, asking how many tapings per day the winners do. He said they tape five shows a day. For Jeopardy! champion Ken Jennings to win seventy-four consecutive games, he had to win five games in a row, then get up the next morning and go win another five games. Whew indeed! The show tapes Tuesdays and Wednesdays, three weeks a month, nine months a year. Gilbert introduced two of the three Clue Crew members who were at the taping—Sarah and Jimmy. When the pair stood up and waved to the audience, I saw that Jimmy was wearing a maroon hoodie with "HARVARD" emblazoned on the front in big letters. Yeah, OK. You're smart. A fortyish woman asked Trebek what his favorite karaoke song was. He replied, "My favorite karaoke song?" then turned his head to the side and pretended to spit on the floor, saying: "I hate karaoke." Another audience member asked him what he thought about rap music. As he began to criticize it, he seemed to pause and take a quick scan of the audience, then said he disliked most of it because of the bad language and negative references, adding that he thought it was a bad influence on youth. "Not all of it is bad, but most of it," he said, apparently not wishing to condemn the entire black youth culture. When one of the contestants incorrectly answered "era" instead of "eon" in response to a science question requiring a three-letter word with two vowels, Trebek told the young man that "era" was not a scientific term. One of the fact checkers disagreed. Trebek seemed to think "era" had only a generic meaning. But after the fact checker disagreed, he walked over to the front of the stage where a semicircle of fact checkers are located in a pit behind computer screens and telephones, and picked up one of their dictionaries. 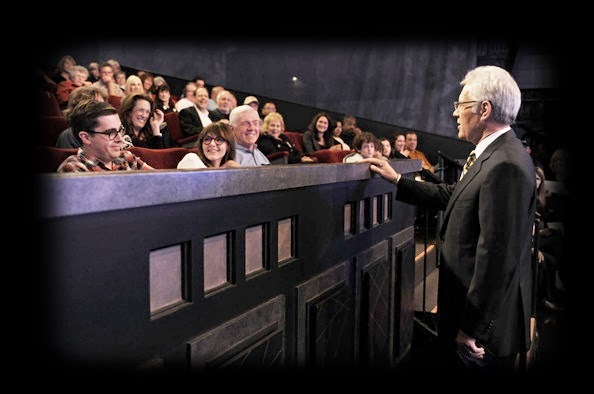 He seemed genuinely interested in making sure he had the correct information, although the staff photographer who took candid photos during the taping of the show moved quickly into position to take a few shots of Trebek studiously peering into the dictionary. He lingered just long enough to ensure a good publicity shot. When asked what books he's read, Trebek said he reads a lot of nonfiction, "political stuff," and also likes novelist "John . . ." and then couldn't think of the author's last name until an audience member called out: "Grisham." Then he mentioned finishing a book during a recent trip, but could not remember what it was. "It'll come to me," he said. It didn't. So even the sharp-witted Trebek, adjudicator of all knowledge, cannot escape the symptoms of an aging mind. Or perhaps it was just overload, considering all the data that had passed through his brain by the last taping of the day. It was the fifth and last show during a day in which he'd already articulated 264 questions with but a very few misspeaks. Is this reassuring to those of us who worry about occasional memory loss? I don't know, but I'm gonna keep playing.